A blog on organic food and everything else about living in harmony with nature. A good healthy diet can’t be without nuts. But all nuts are not equal. Sprouted nuts release more nutritional energy – get more with less! 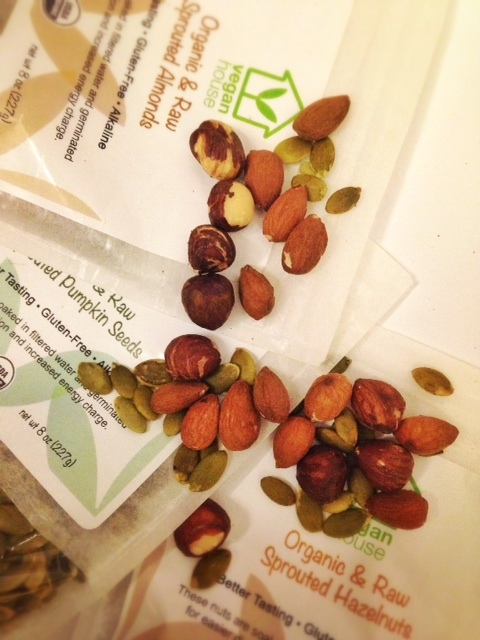 Vegan House’s sprouted nuts are germinated to release more nutritional value. These nuts are soaked for 24 hours in osmosis filtered water, then dehydrated slowly at low temperature and humidity. This slow process destroys the enzymes inhibitors in the nuts and allows the body’s enzymes to digest the nuts better. While sprouting nuts are time-consuming, it makes the nuts more nutritious, crunchier and much easier to digest! The high temperatures used to roast the nuts actually damage the fats, and form free radicals. These dangerous substances will not be produced when soaking, sprouting or dehydrating raw almonds at the usual low temperatures. Get the Sprouted Nuts Trio pack (8oz./227g each) with great savings!